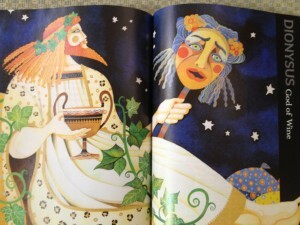 Business Leadership Profiles from Greek Mythology: Delirious Dionysus! Yes, Dionysus was the life of any immortal party. But he was also the youngest god, the only one with a mortal mother, and the god of some heavy-duty concepts (such as ritual madness and, um, religious ecstasy). So what the heck does this have to do with the business world? Well, don’t you know someone at work whom everyone relies on for inspiration during work hours (and for social relief after work)? You know–the guy (or gal) who whips everyone into a frenzy before pushing out a big proposal or making a huge presentation to a prospective client? It’s likely you have a wandering, cult-like Dionysus on board. This leader’s emotions range from joy and happiness to awe-inspiring rage–the potential outcomes of cultivating and imbibing in fermented grape juice. Dionysus’s Wildness Stems from His Parents’ Electrifying Relationship: The story of Zeus’s obsession with Semele, daughter of King Cadmus of Thebes, is well known in Greek mythology. Wanting her as only the king of the gods could, Zeus had his way with the beautiful Semele, which greatly pissed off his wife (and Mt. Olympus Senior Vice President), Hera. Despite knowing the inevitable outcome, Zeus revealed his mighty thunderbolt and unwillingly incinerated Semele, both her body and spirit. But what about the unborn babe inside her: Dionysus? Fortunately, the god of wine’s future life didn’t wither on the vine. Zeus salvaged him from Semele’s womb and stitched Dionysus into his own leg! After his son’s “second” birth (from Daddy Zeus’s immortal thigh), the king of the gods assigned his messenger, Hermes, the task of transporting little Dionysus to Semele’s sister, Ino (and her husband, King Athamas). Your mortal version of Dionysus may be challenging to rein in at times, but his intent to teach others how to grow something of their own is genuine. Give him some room to roam! Beware Your Professional Pied Piper’s Ecstatic Effect on the Ladies…: Dionysus was one of those Greek gods with a dual personality. Yes, he did a lot of good by encouraging cultivation of a delicious fruit. But the other part of the equation is fermentation of that aforementioned fruit, which is when the out-of-control aspect of his cult-like personality took control. Dionysus continued to wander the world before settling into his junior-executive position on Mount Olympus. He was accompanied by his teacher, Silenus (a satyr who helped raise him), more partying satyrs (woodland creatures that were half man, half goat), and a growing collection of Grecian gals, the Maenads. These ladies were no mere groupies. They were were “wild women” attracted to Dionysus’s immortal vibe. For them, the female responsibilities of childbearing and the harvest paled in comparison to Dionysus’s bodacious Bacchanalia. The take-home here is: Allow your modern-day Dionysus ample opportunity to instill knowledge in others. Let him travel for educational purposes on your company’s behalf. Just don’t give him complete freedom when organizing office celebrations and after-hours parties that include consumption of alcoholic beverages. You’ve been warned! Dionysus Prowled the Executive Suite in a Chariot Pulled by Panthers, His Thyrsos in Hand: Although Dionysus lived by his grapes and goblet, he had other sacred symbols, including the thyrsos (or thyrsus). It was a magical wooden staff wrapped in ivy leaves and vines, capped off with a pine cone. The reason I call his thyrsos magical is that Dionysus could use it to play a mythological version of “Rock Paper Scissors.” With his thyrsos, the dude could transform a rock into water, and then turn ancient agua into vino. Can you imagine having the modern-day equivalent of a thyrsos available in your office?!? Best of all, when Dionysus appeared at one of his theatrical festivals (as a patron god of the dramatic arts), his means of transportation was a glorious chariot. The exotic beasts pimping Dionysus’s ride represented his sacred animals: leopards and tigers and panthers (oh my)! Also, you typically see Dionysus depicted on archaic statues and vases wearing a wreath of ivy (holly) vines. This crowning glory represents more than Dionysus’s immortal status as a child of nature; it’s also a symbol of his decadent indulgence in wine, merrymaking, and celebrations. When Contemplating Your Business’s Rebirth, Dionysus Is the Immortal You Want by Your Side: Allegedly, Dionysus was one of the few Greek gods or goddesses who could bring someone back to life. As a child, he never knew his mother, due to her unfortunate lightning-bolt immolation by Zeus. Thus, Dionysus dared to travel to Hades’s playground (also known in Greek mythology as the Underworld), fetch Semele, and bring her back to Dad’s headquarters on Mount Olympus. Another myth attributed to Dionysus is that upon his birth, Hera ordered the Titans to shred him into unrecognizable bits and pieces, which they did. But Zeus couldn’t bear for Semele’s only child to perish at the hands of his mad-hatter wife, so he persuaded Rhea (Zeus’s mommy–also a Titan) to bring Dionysus back to life (which she did). The god of wine was one unstoppable Greek deity–kind of like the unsinkable Molly Brown! Whether your business is about to transform itself through a re-branding or pull back from the precipice of a potential scandal, ensure you have a fearless Dionysus on your executive team. Does this leadership profile from Greek mythology ring true for a certain master of viticulture working with or for you? After hitting the highs via a successful marketing event or sales presentation, does your company’s Dionysus hit some lows by raging against the (corporate) machine? Business Leadership Profiles from Greek Mythology: Helpful Hermes! Business Leadership Profiles From Greek Mythology – Tenacious Hera! Great Zeus – Business Leadership Profiles From Greek Mythology!